Tytec's solid tyres are unique in their design and manufacturing process by using the latest in manufacturing equipment technology and unique their design by using Finite Element Analyzing in the design phase. Tytec solid tyres are used in extreme and abusive conditions where pneumatic and foam fill tyres find it hard to perform. 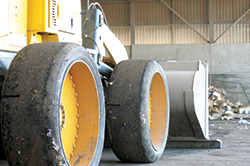 Tytec manufacture a range of different solid tyres in construction and rubber compounds to suit your application so we deliver the best performing solid tyre and cost per hour tyre for your operation. No downtime due to flats or failures. Reduced number of tyre changes. Reduced potential of tyre related bursts and explosions. Reduced exposure to risk during tyre/wheel changing procedures. 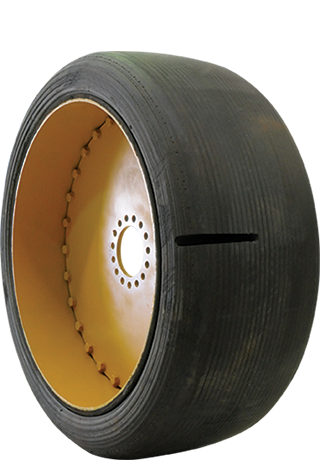 Pressure maintenance becomes obsolete, thus minimizing risk to tyre and workshop personnel.